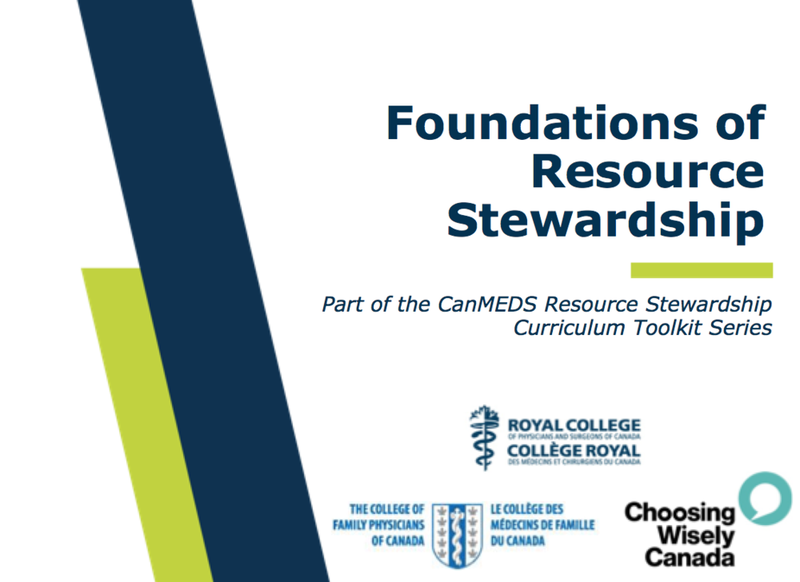 Over the past year, I had the opportunity to contribute to the formation of several toolkits on the topic of "Resource Stewardship." These toolkits were created by the Royal College of Physicians and Surgeons of Canada (RCPSC) in partnership with Choosing Wisely Canada and the College of Family Physicians of Canada (CFPC). The aim was to create modules that educators could use in order to encourage residents to be mindful of overdiagnosis, overtesting, and overtreating as they prepare for practice. By empowering them to have conversations with patients about unnecessary medical interventions and to undertake Quality Improvement projects in this area, preceptors can ensure that physician trainees satisfy the societal duty (as well as a residency education CanMEDS requirement) to be good stewards. Foundations - basic information, vocabulary to facilitate residents becoming mindful of considering the (broad) harms and benefits of any test, treatment, or procedure. You can find more education resources on the teaching page.